Protect your tuition commitment against unforeseen qualifying events. Why do you need The TPP? Each school year all families enter a contract with WCA whereby they are financially obligated to pay the full annual tuition for their child to attend the school, regardless of withdrawal or inability to pay. 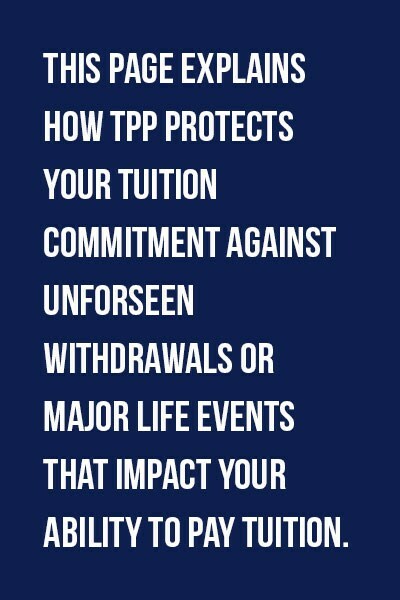 The TPP provides peace of mind for families who cannot or do not wish to be exposed to the possible loss of thousands of dollars in tuition charges. If your son or daughter experiences a qualifying event, the TPP will waive your tuition obligation (subject to the terms of the plan) to the school on your behalf to help you meet your existing obligation. Q: Must I participate in the TPP? A: The Tuition Protection Plan is mandatory with the election of a monthly, quarterly, or 2-pay payment plan. Families whose accounts are paid in full prior to July 1 are encouraged to purchase the TPP to protect their tuition investment in the event of a qualifying event. Q: What is the cost of the TPP? A: The cost of the Tuition Protection Plan is $150 per student. Payment is due with submission of the enrollment contract. Q: What is a qualifying event? A: Qualifying events are specific unforeseen circumstances that arise during the school year that result in either the inability to pay your contracted tuition obligation or a withdrawal. Q: When does the TPP go into effect? A: The TPP applies beginning July 1 through the last school day of the current school year. Withdrawals prior to July 1 are subject to the withdrawal penalties outlined in the enrollment contract. Medical/death of student - The plan will waive 100% of remaining unused yearly tuition and fees (less re-enrollment fee, TPP fee, and tuition assistance), provided the student’s injury or illness forces the student to withdraw from school. Covered tuition and fees are waived retroactive to date of withdrawal notice accompanied by a licensed physician’s recommendation for withdrawal. Death of tuition payor – The plan will waive 100% of the full academic year’s tuition and fees (less re-enrollment fee, TPP fee, and tuition assistance) for the current school year, allowing the student to complete the academic year. Covered tuition and fees are waived retroactive to the date of the death. The tuition payor is the person or persons financially responsible for tuition per the enrollment contract. Involuntary unemployment of tuition payor – The plan will waive 100% of remaining yearly tuition and fees (less re-enrollment fee, TPP fee, and tuition assistance) for the current school year, allowing the student to complete the academic year. Loss of income must be greater than 15% of the household income. The tuition payor is the person or persons financially responsible for tuition per the enrollment contract. Academic/Disciplinary withdrawal or expulsion – The plan will waive 75% of remaining unused yearly tuition and fees (less re-enrollment fee, TPP fee, and tuition assistance), provided the principal has recommended the student withdraw or be expelled due to academic or disciplinary reasons. Covered tuition and fees are waived retroactive to the date of the withdrawal or expulsion. Mental health conditions - The plan will waive 75% of remaining unused yearly tuition and fees (less re-enrollment fee, TPP fee, and tuition assistance), provided the student’s physician diagnoses a mental health condition as referenced in DSM V. Covered tuition and fees are waived retroactive to the date of withdrawal notice accompanied by a licensed physician’s recommendation for withdrawal. Job transfer – The plan will waive 50% of remaining unused yearly tuition and fees (less re-enrollment fee, TPP fee, and tuition assistance), provided the student’s family has a job relocation of greater than 40 miles from either WCA campus or available bus route. Covered tuition and fees (less re-enrollment fee, TPP fee, and tuition assistance) are waived retroactive to the date of the last day of classes attended. Involuntary wage reduction of greater than 15% of household income over 3 or more months - The plan will waive 50% of remaining unused yearly tuition and fees (less re-enrollment fee, TPP fee, and tuition assistance) for the current school year, allowing the student to complete the academic year. Covered tuition and fees (less re-enrollment fee, TPP fee, and tuition assistance) are waived retroactive to the 91st day following the continued involuntary wage reduction of greater than 15% of household income. Voluntary withdrawal – The plan will waive 50% of remaining unused yearly tuition and fees (less re-enrollment fee, TPP fee, and tuition assistance) for all other withdrawals. Covered tuition and fees are waived retroactive to the date of the last day of classes attended. Waivers are based on actual calendar days in the school year (excluding weekends and holidays) beginning with the first day of formal academic instruction (excluding pre-season athletic practice, orientation, registration and open house) and ending with the last day of formal academic instruction, including examinations. “Withdrawal or absence for medical reasons” means complete, involuntary severance from classes as certified to and regularly treated during the period of coverage by a legally qualified medical practitioner, not related to the student. “DSM V” is the American Psychiatric Association’s Diagnostic and Statistical Manual Fifth Edition. “Scholastic or disciplinary reasons” must be at the recommendation of principal. July 1 through last school day of the current school year. LATE-ENTERING STUDENTS: Coverage begins on the date the $150 fee is received. Request for Waiver forms with instructions are available at the Business Office. Request for Waiver must be reported within 30 days from the date of the qualifying event. Waiver will be applied to the student’s account. Credit balances not required to settle your account, if any, will be returned to you. In no case will a waiver be granted without a complete claim form with all accompanying documentation. Waivers must be approved by the Business Office Manager. The cost of the Tuition Protection Plan is $150 per student. Fee payment is due with enrollment contract. All families who do not pay their full annual tuition and fees prior to July 1 are required to purchase the plan. Upon receipt of completed Request for Waiver forms and required documentation, waivers are calculated and allocated in the manner set forth below. The academic year is considered the actual calendar days school is in session arising between the first class day of the school year in the fall and the last day of final exams at the end of the school year. For example, Joe Student’s father was offered a job in Houston in November. Joe’s last day at WCA is November 14th, leaving 112 consecutive calendar days remaining in the academic year valued at $3,888.47. When Joe’s father signed the contract at the beginning of the school year he committed to pay $6,010, choosing the 60/40 payment option. Joe’s father already paid $3,606 toward that commitment leaving $2,404 owed by December 1st. Because the qualifying event was a job transfer, the Tuition Protection Plan would waive 50% of the covered unused tuition and fees equaling $1,944.24. By contract, Joe’s father still owes the remaining $2,404 in tuition and fees ($6,010 less the $3,606 he has already paid), but with the benefit of the Tuition Protection Plan waiving a portion of his obligation, Joe’s father will only owe WCA a final payment of $459.76. Please see the chart below for examples of how the TPP protects Joe Student’s family for other qualifying events. As you can see, for some situations, Joe’s father may even get a portion of covered tuition and fees paid back to him.